Tomorrow we're doing a little early St. Patrick's Day dinner. Tonight, I decided, to do something a little lighter and more meat-free. At the store I picked up a few items to make a very non-Irish meal so that we wouldn't be burned out on Irish cuisine (and by that I mean fake American-Irish cuisine) before St. Patrick's Day. 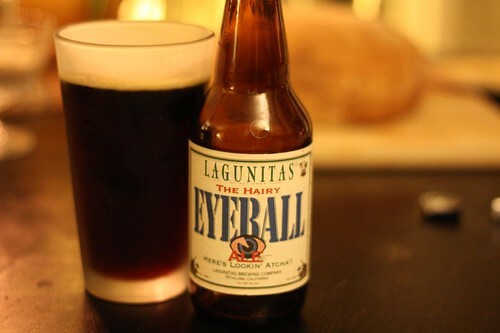 I started off with a non-Irish beer, this Hairy Eyeball Ale from Lagunitas. This is maybe the most unusual tasting beer I've ever had. At 9.0% alcohol it reminded me of what gasoline might taste like. It seems like a petroleum product and doesn't even feel like it's making contact with any surface of your mouth, but rather, hovering in some sort of anti-gravitational state within. Now, I don't want this to sound like I'm bashing this beer. I actually enjoyed it very much. I have always liked the smell of gasoline. In fact, as a young child, I was often yelled at by my father, because I liked to take the gas cap off of his pickup truck and inhale the fumes. My cousin enjoyed doing this as well and so far neither of us have died or contracted a life-threatening illness. 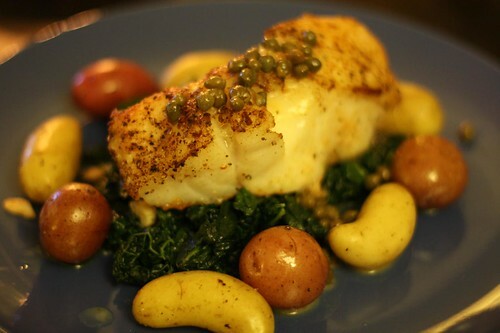 I got a nice piece of hake which I pan seared and finished in the oven. I served it with dinosaur kale that I wilted in a pan with olive oil, garlic, salt, and pepper. I also boiled these wee bee pee wee mixed potatoes from Arrow Farms in Chelsea, Massachusetts. I just like to say, "Wee Bee Pee Wee." After the hake was roasted I removed it from the pan, added white wine, lemon juice, capers, and a pat of butter than I poured over the top. And with that simple white fish dinner it's time to let the early Saint Patrick's Day feasting begin. Be prepared for an onslaught of bastardized (and completely invented) Irish dishes! Be warned: there will be no green beer.